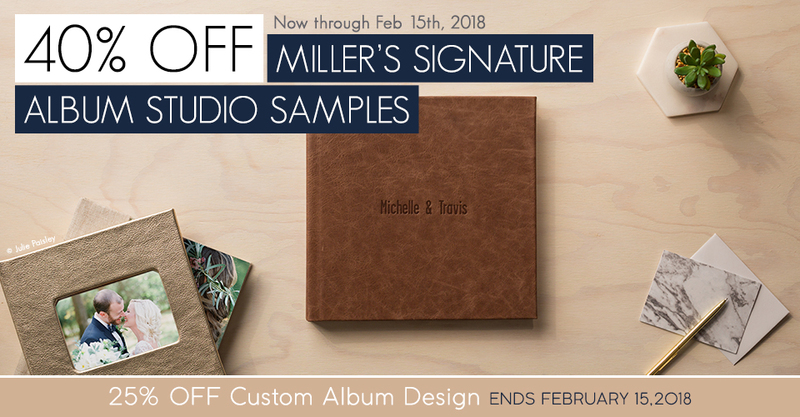 Enjoy 40% off Miller’s Signature Album studio samples through February 15th. From weddings to seniors, the Miller’s Signature Album is the ultimate keepsake for every client. As an added bonus, we are also offering 25% off Custom Album Designs from the skilled team of artists in our Art Department. To order your samples, select the “Studio Sample” option in the shopping cart in ROES or enter code “SAMPLEALBUM” in the voucher code area in Designer Plus. The back cover of your album will be stamped “Sample, Not for Resale.” Please note, Companion Albums will not receive an additional 40% off. Please Note: This sale is valid for Miller’s Signature Album studio samples and Custom Album Designs only. This offer does not apply to Companion Albums, Miller’s Signature Books or Softcover Signature Books. This offer is available through ROES and DesignerPlus but is not available on orders submitted through Fundy Direct. Select the “Studio Sample” option in the shopping cart in ROES or enter code “SAMPLEALBUM” in the voucher code area in Designer PLUS. The back cover of your album will be stamped “Sample, Not for Resale”. The sale price will not be reflected in order summaries or email confirmations. The discount will appear once the order has been received by the lab. The cost of Custom Album Design does not include the cost of the physical album. Offer expires at 11:59 p.m. (Central) on February 15th. What is the turn around time for this album? I need a couple of samples for a bridal show on Sunday! Hello Carrie, our albums are typically turned around in 1-3 days. Im having trouble getting the 40% off on the sample album I just created in Designer Plus. I completed what i wanted and added to it my cart but im not seeing the option to choose sample album. Could you help? Hi Abby, place SAMPLEALBUM in the voucher code area at checkout in Designer Plus. How does a sample differs from a regular signature album? Does it say “sample” in it or does it have anything printed in the spreads? I too just created an album in Fundy for Direct ordering and there is no voucher code area to enter the samplealbum you referenced above. I am not wanting to order without knowing that the sale price will be honored. I thought Fundy said in their YouTube video their prices were updated to reflect your sales; but that is not the case in this instance. Hi Lorena, the back cover of the album will be stamped “Sample, Not for Resale”. Let us know if you have any further questions! Hello Bonita, this offer is not available through Fundy Direct. Our sincerest apologies for the confusion. Hi! I’m at the shipping part of checkout for an album I just created. With free shipping to me, what is the expected ship time? Like how long does it take to ship and within how many days (roughly) would I receive the album? I need it by next Thursday to show boudoir clients. Just wondering if I need to expedite shipping or not. Thanks! Hi Liza, thanks for reaching out. We produce albums in the lab in just 1-3 days, and then it will ship overnight. If you ordered last night, or if you still need to order and get it placed before the end of the day, you should definitely have it before Thursday. I Absolutely love the sample sale! I’ve been waiting for you to offer one for the new year and I’m thrilled you have because I ordered all of my studio signature albums at once to show to clients in the future. Thank you! I was looking at designing the sane album but in different sizes and cover options. Is there a limit on how many samples where allowed of the same album design? (I found out about this from PPA, where I am a member). My apoologies for the delay Aaron, but there was no limit! Will you go back to the 25% off till November? for sample as in past. Hello Scott, that is correct!